The image from Dawn’s framing cameras was taken on May 3 when the spacecraft began its approach and was approximately 752,000 miles (1.21 million km) from Vesta. 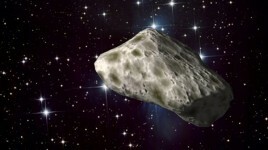 The asteroid appears as a small, bright pearl against a background of stars. Vesta also is known as a protoplanet, because it is a large body that almost formed into a planet. Vesta is 330 miles (530 km) in diameter and the second most massive object in the asteroid belt. Ground- and space-based telescopes obtained images of the bright orb for about two centuries, but with little surface detail. Mission managers expect Vesta’s gravity to capture Dawn in orbit on July 16. To enter orbit, Dawn must match the asteroid’s path around the sun, which requires very precise knowledge of the body’s location and speed. By analyzing where Vesta appears relative to stars in framing camera images, navigators will pin down its location and enable engineers to refine the spacecraft’s trajectory. Dawn will start collecting science data in early August at an altitude of approximately 1,700 miles (2,700 km) above the asteroid’s surface. As the spacecraft gets closer, it will snap multi-angle images allowing scientists to produce topographic maps. Dawn will later orbit at approximately 120 miles (200 km) to perform other measurements and obtain closer shots of parts of the surface. Dawn will remain in orbit around Vesta for one year. After another long cruise phase, Dawn will arrive in 2015 at its second destination, Ceres, an even more massive body in the asteroid belt. Gathering information about these two icons of the asteroid belt will help scientists unlock the secrets of our solar system’s early history. The mission will compare and contrast the two giant asteroids shaped by different forces. Dawn’s science instruments will measure surface composition, topography and texture. Dawn also will measure the tug of gravity from Vesta and Ceres to learn more about their internal structures. The spacecraft’s full odyssey will take it on a 3-billion-mile (5-billion-km) journey, which began with its launch in September 2007. Dawn’s mission to Vesta and Ceres is managed by JPL for NASA’s Science Mission Directorate in Washington. Dawn is a project of the directorate’s Discovery Program, managed by NASA’s Marshall Space Flight Center in Huntsville, Ala. The University of California in Los Angeles is responsible for overall Dawn mission science. Orbital Sciences Corp. of Dulles, Va., designed and built the spacecraft. 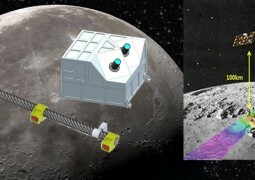 The framing cameras were developed and built under the leadership of the Max Planck Institute for Solar System Research in Katlenburg-Lindau in Germany, with significant contributions by the German Aerospace Center (DLR) Institute of Planetary Research in Berlin and in coordination with the Institute of Computer and Communication Network Engineering in Braunschweig. The framing camera project is funded by NASA, the Max Planck Society and DLR. South Korea’s first lunar space probe will launch in 2018 carrying a suite of newly developed instruments.